Saturn has become a symbol of the revolution for many classics. The statement about the revolution, which devours its children, like Saturn, everyone can see in the epic «Red Wheel» by A. Solzhenitsyn, and in the play «Lunin or Jacque Death» by Edvard Radzinsky, and other well-known authors. Saturn — is the god of the Roman pantheon, identified with the Greek Cronos, the youngest son of the god Uranus (the sky) and the goddess Gaia (the earth). Cronos became the supreme god, who castrated his father. His own newborn children he swallowed, because the prediction said, that one of them would deprive him of power. But even the gods can’t run away from their fate: Zeus, who was sheltered by his mother from father, deprived him of power and reigned over the world. Before that he forced Cronos to belch swallowed children, and they became Olympic gods. But the sons of the revolution, which it swallowed up, fell into the pantheon only posthumously. Nikolai Vasiljevich Krilenko (May 2 (14), 1885-1938) was born in the village Behteevo Sychevsky district of Smolensk province in the family of an exiled official. In 1903 he entered the historical-philological faculty of the St. Petersburg University and immediately joined the students revolutionary movement. In December 1904 he joined the RSDRP, became one of the top-ranked leaders of the students revolutionary movement, organizer of the illegal gatherings, meetings, demonstrations. In 1909 he graduated from the University, and three years later went to law faculty. After the victory of the Great October Revolution, N.V. Krilenko became a member of the first Soviet government as a member of the Military and marine affairs Committee. In November 1917, V.I. Lenin, on behalf of the CPC ordered to appoint N.V. Krilenko the Supreme Commander of the Soviet Republic. From December 1917 to February 1918 he engaged in the formation of the Red Army, participated in the organization of defense against the German attack. In March 1918, after the conclusion of the Brest peace, the party directs N.V. Krilenko to the agency of Soviet justice. N.V. Krilenko’s practical and theoretical work in the justice agency made him into the ranks of the most prominent lawyers of the Soviet Union: since 1918 — Chairman of the Central Executive Committee of the Supreme Revolutionary Tribunal, 1931 — People’s Commissar of Justice of the RSFSR, and in 1936 — People’s Commissar of Justice of the USSR. Under him was laid the legal basis for carrying out mass repression, widespread practice of punishment for political reasons, the mass arrests and extrajudicial persecution. In 1934, the Presidium of the Communist Academy awarded him the degree of State and Legal Sciences Doctor. N.V. Krilenko did a lot for the alpinism and tourism development in our country, he was one of the organizers, and then for many years Public chairman of the proletarian tourism and excursions society (PTES), he was there, when in 1929 was set up the mountain section, that brought together all the climbers of the country. In 1935 he was the first, who got the title of honored alpinism master. In 1938 he was arrested on charges of belonging to an anti-Soviet organization and by the verdict of the USSR Supreme Court Military Collegium sent to the shooting. 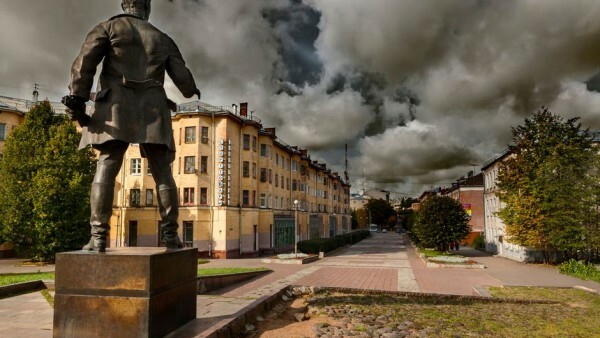 He was rehabilitated after Stalin’s death for lack of evidence, and in September, 25, 1985, the day of the liberation of Smolensk from the Fritz, in a solemn ceremony was set a monument in his honor. At the meeting besides the representatives of the local party-soviet agencies were also present workers of the USSR prosecutor’s office, the Ministry of USSR Justice, the Main Political Administration of the Soviet Army, the son of Krilenko Sergei Nikolaevich, and daughters Marina Nikolaevna and Irina Nikolaevna. N.V. Krilenko’s sculpture made by sculptor V.E. Gorevoy, the authors of the area improvement, structures and retaining walls of the pedestal — the architects N.A. Sokolov and I.I. Marchenkov. The monument was set in the Smolensk city center, on the crossing of Marshal Zhukov and the Communist streets, opposite the CC «Provincial.» On the pedestal west face, at the top, there is the inscription made from metal volumetric letters: » Nikolai Vasiljevich Krilenko» On the top edge of the south face there is another inscription: «1885-1938 the monument constructed in honor of the 100th anniversary of prominent Soviet party, state and military leader.» The total height of the monument is 5,90 m. A bronze sculpture, with face turned to the west. N.V. Krilenko is captured addressing to the workers audience. 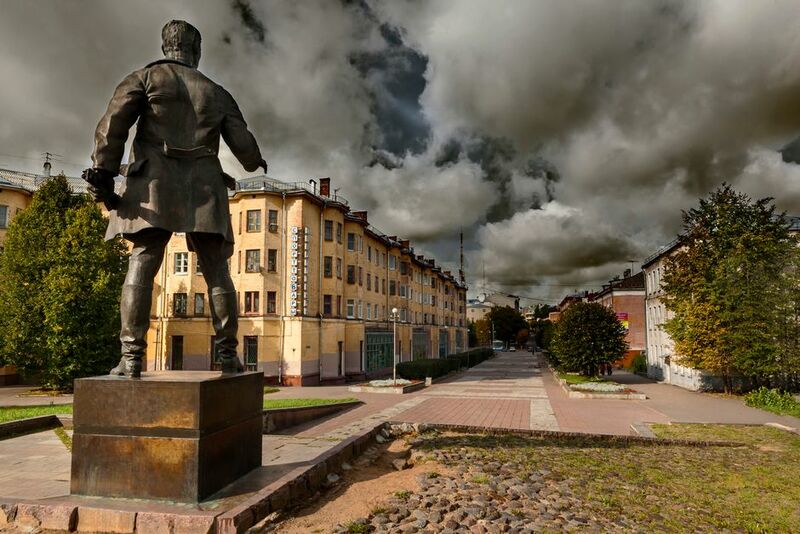 The monument to N.V. Krilenko is an object of cultural heritage.